In May we completed the 10 weeks SYF/EV2 training at Avondale Christian church. We had several OJTs and at the completion of all of them, 18 people heard the gospel and six made professions of faith. Glory to Jesus! 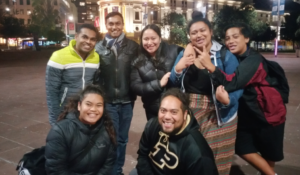 Below is our team who witnessed at Aotea square. We also had a Filipino church in Christchurch, “Jesus Christ the Rock Ministries”, that was trained by Rene from EE Philippines, where 40 people were trained. During the OJT, 11 heard the gospel and nine made profession of faith. They will now be followed up and discipled. 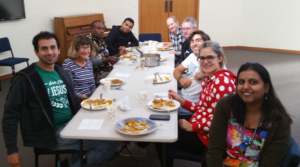 We also had our first XEE training for this year at Greenlane Presbyterian Church on the 19th May with representation from 8 different nationalities: Brazilian, Chilean, Columbian, Kenyan, Vanuatu, Indian, Malaysian and Kiwi. The training went really well and we are now doing five weeks of follow-up training every Tuesday night. (Shanthi made her famous Malaysian chicken curry for lunch. It was a great hit). Here is the picture from the XEE workshop. I have a confirmed XEE training at Lynfield Community Church commencing 30th June. It is now open for registration and if you are interested in attending, please email and let us know. I also received an opportunity to preach at St Chad Anglican Church in Remuera. It went really well and we have an opportunity to run an EE workshop at St Chads in the coming month. The Lord always opens the door for EE ministry. Thank you for all your prayer and financial support. I was sad to miss the Annual Supporters’ Dinner, which from all accounts was a very inspirational evening. I was on the way to Malang, Indonesia, to join the other VP’s for our half-yearly conference. It is always great to pray, learn, discuss and plan together as a team. John Sorensen, EE International President, generally gives us a report on the health of the global work to see if the world-wide ministry is growing, plateaued or declining. Regular evaluation helps find out what needs to be improved or refined. Seven Vital Signs of a Health Ministry have been established as being: Active Churches, Training Events, Reported Professions of Faith, Field Staff, Hope for Kids, Gross Revenue and Active Donors. Praise God that, in the first quarter of this year, six of the signs indicate health, but there is one area of real concern: the number of active EE churches world-wide appears to be declining. First and foremost, EE is an equipping ministry and it is a lost opportunity when church members train in EE, but fail to go on and train anyone else. As Dr. Kennedy said, “Just as it’s better to teach a person to fish rather than merely give them a fish; it’s more important to train a soul winner than to save a soul.” That is how every person in the world can be reached with the Gospel. Please pray that in all our EE workshops, God will raise up church members who will take responsibility for training and equipping others. Shortly after I returned from Indonesia, we welcomed Simon Lovo, Vanuatu National Director, who stayed a week in Auckland and visited the EE Office most days. He also spent time with our leaders and even joined in the XEE Workshop at Greenlane on 19 May. One day, Ada Shea, Chinese Ministry Director, came to see Simon and took us both out for a delicious lunch. You may remember that EE was introduced to the Chinese Church in Port Vila by her mission leadership team in April last year. Returning this year, they found the Church had doubled in size. She reported the great news that the Church, having enthusiastically implemented EE, now has so many new believers that their church building has become too small! More than that, they are planning to plant a Chinese church on the neighbouring island of Malekula. This is evangelism explosion.